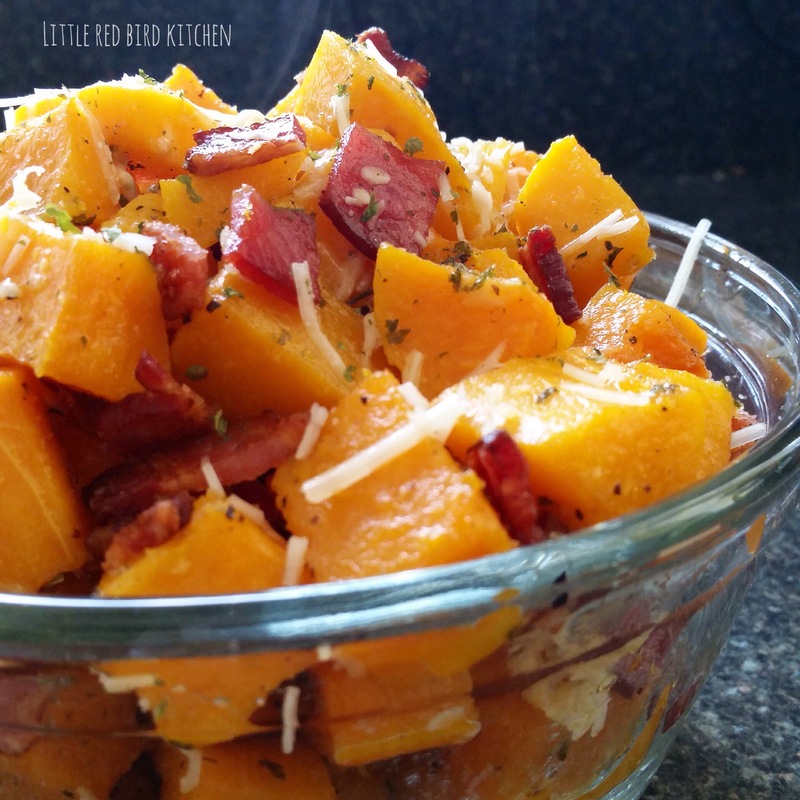 Here is a simple, yet very tasty recipe made up of butternut squash, BACON, and Canadian bacon. Why Canadian bacon you ask? Well, because, it had the word bacon in the label. Even though Canadian bacon is technically not bacon, it made a nice addition to this side dish. Butternut squash can be tough to cut through, so I suggest peeling it first, and then cutting the “neck” instead of halving it from top to bottom. It’s easier to hold laying down because it can be a little slippery once the skin is off. It will also give you a flat piece (the bottom part of the neck that you sliced) to position on your cutting board so the butternut squash does not wabble. This will help you cut nice, 1 inch slices, from top to bottom, that can then be cubed. And to keep the bacon momentum going, I added some bacon fat. Whenever we make bacon, my husband will strain the leftover fat into a container using a mesh strainer lined with a paper towel or two to keep the little flecks from straining into all the glory that is bacon fat. It’s then stored and safely kept in the refrigerator. This little jar is a culinary fat secret weapon. I use it I place of butter frequently in both cooking and baking. It also makes for a great dairy free alternative. Using bacon fat is not mandatory, although, it is strongly encouraged. You can sub in whatever fat you want to use. And if you don’t have or want to use Canadian bacon, then use all bacon. Now, onward. It’s recipe time. Preheat the oven to 400 degrees. Lay sliced bacon and cut up Canadian bacon on a sheet tray and bake for about 10-15 minutes, or until crispy. The rendered fat from the bacon will crisp up the Canadian bacon. Meanwhile, cube the butternut squash and place it on another sheet tray. Add melted bacon fat, salt, pepper, onion and garlic powder, and parsley flakes. Take bacon out of the oven and place it into a bowl lined with a paper towel. Bake the butternut squash for about 15 minutes, or until they are fork tender. Take cooled bacon and crumble and then add both bacon bits over the butternut squash. Add Parmesan cheese if desired, and place back in the oven for 5 extra minutes, or until cheese melts.